What’s Matchamisu? 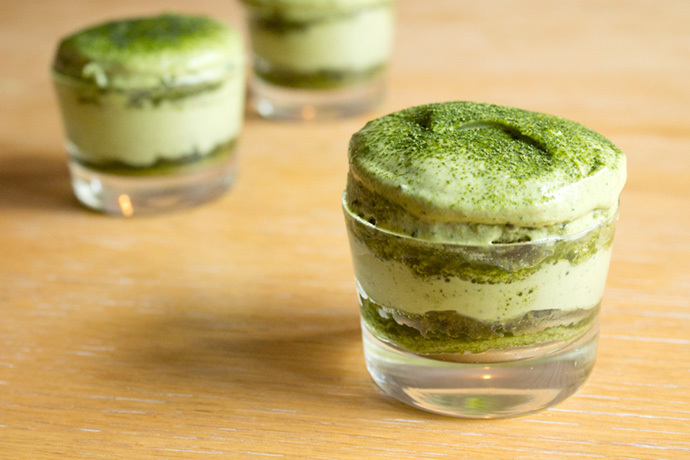 It’s a matcha green tea tiramisu! 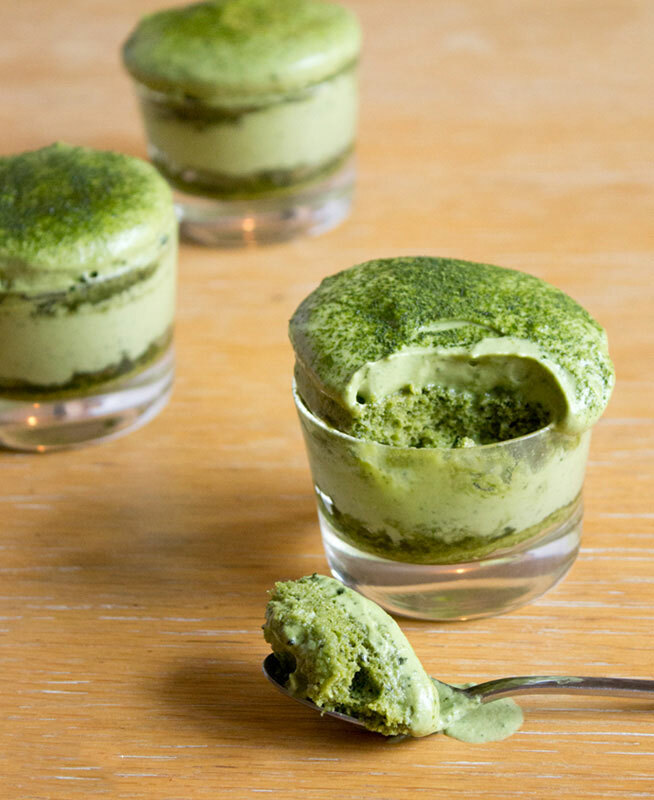 This matcha tiramisu recipe is THE original and the best. My baking guru, Queenie, came up with the name Matchamisu and the recipe. It’s utterly brilliant. 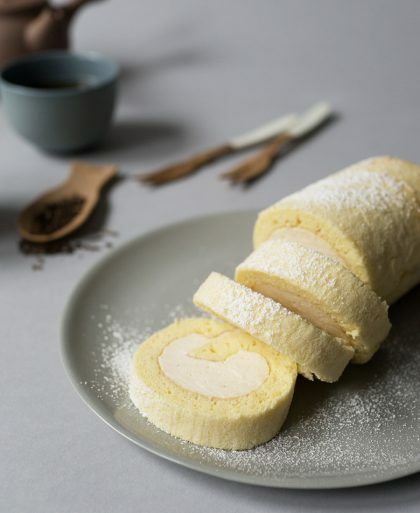 She took a classic Italian dessert, the tiramisu, and gave it a green tea spin by replacing espresspo with matcha green tea. Even better, they’re adorable since each one is a mini portion. Get a little adventurous and try swapping out the espresso like we did here with matcha or any fruit like this rhubarb tiramisu recipe. Layer upon layer of matcha! It’s super fluffy and rich with alternating layers of matcha cream and matcha sponge cake. Beware, if you’re sensitive to caffeine, you may want to limit yourself to just one of these decadent tiny treats. The brighter green the matcha is, the better. Look to spend around $15 – $30 regardless of whether it says ceremonial grade or cooking grade. Sugar, eggs, all-purpose flour, confectioner’s sugar, rum, mascarpone cheese, and heavy cream. To make the matcha cream, we used this for as a double boiler. Making the matcha syrup first by bringing water (3/4 cup) and sugar (1/2 cup) to a boil in a pan. Simmer for 3 minutes and remove from heat. Let simple syrup cool, then sift in the matcha (1 tablespoon). Whisk well. This can be made up to a day before. Turn oven on to 350°F. Lay parchment paper on a 13″x18″ sheet tray/jelly roll pan. If the parchment paper rolls up, put a little butter or oil under each corner. 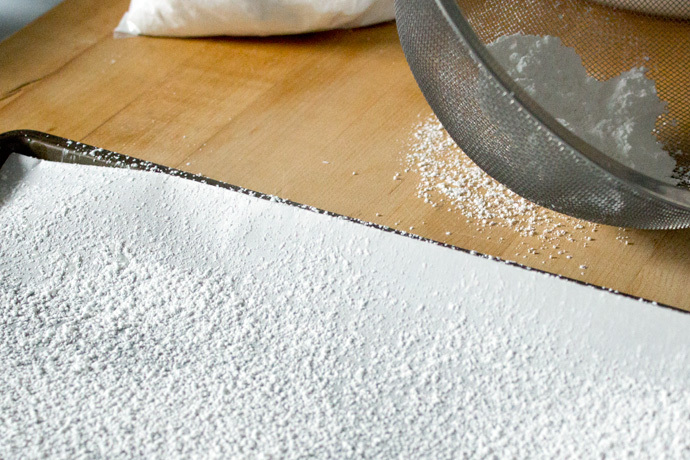 Dust the parchment paper with confectioner’s sugar. Set aside. Separate eggs (4). 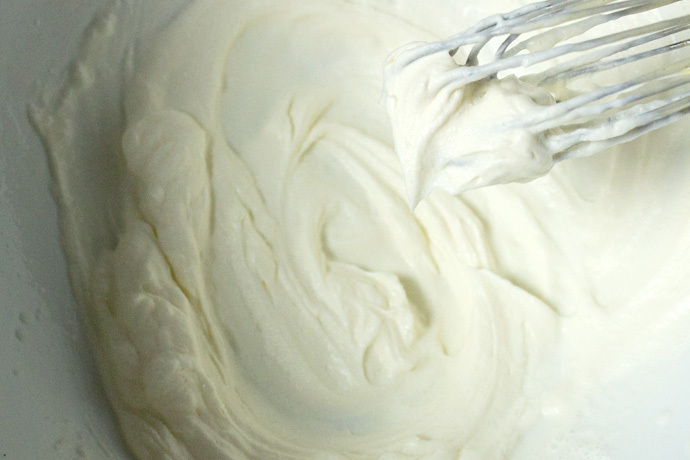 In a mixing bowl, whisk on low speed, then the egg whites for 1 minute. Turn up the speed to medium and slowly add the sugar (7 tablespoons). After the sugar, turn speed to high. Mix until the stiff peaks form and the egg whites look shiny. 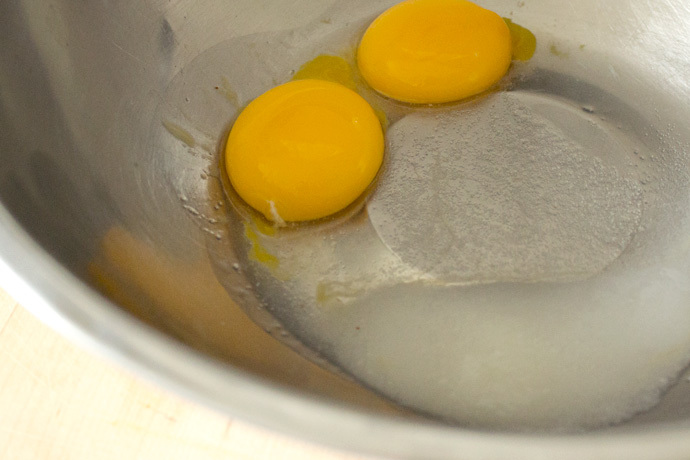 Add the egg yolks (4) and fold to mix. 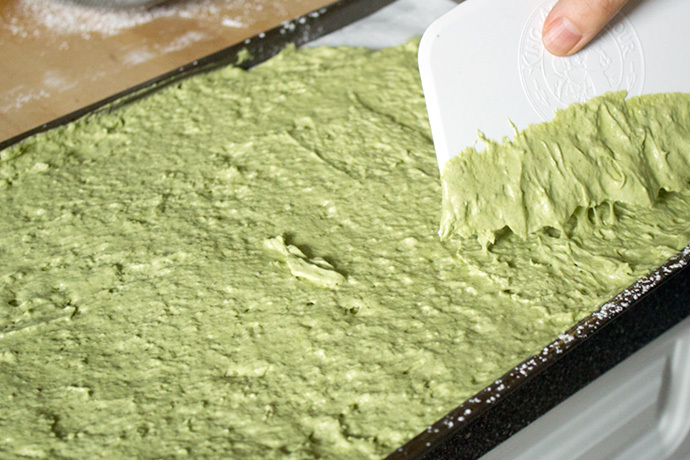 Sift in matcha (1 1/2 tablespoon) and flour (3/4 cup) to the egg mixture and fold. Pour the mixture onto the sheet tray and spread evenly using a dough scraper. Dust confectioner’s sugar on top using a mesh strainer to get an even coat. Bake for 10 minutes. Let cool then use a cookie cutter (we used the 3″) to cut out circles. 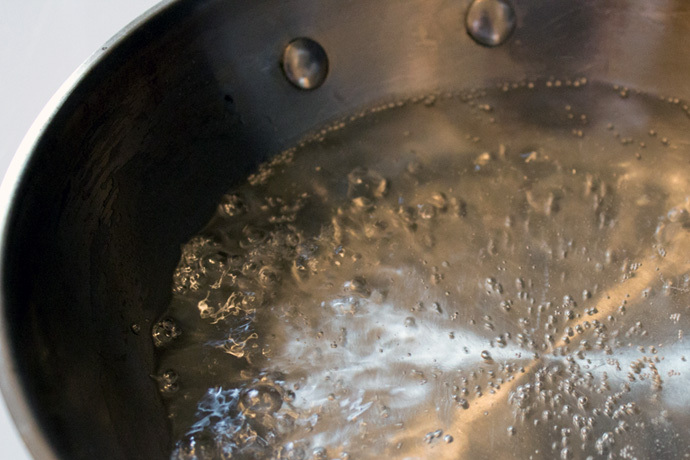 Bring a small pot of water to a simmer. Put the egg yolks (2), sugar (1 tablespoon), and rum (1 tablespoon) in a stainless steel bowl that will sit on top of the pot. Continuously whisk all three ingredients together until it thickens to the ribbon stage (about 5 minutes). Cool for 5 minutes. 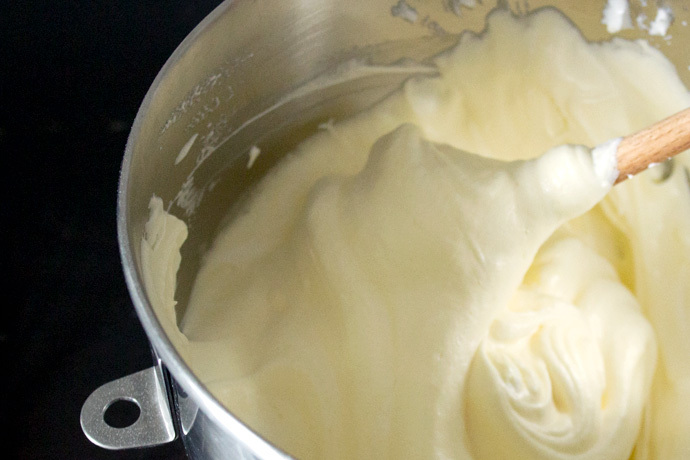 In another bowl, whip the heavy cream (1/2 cup) until soft peaks form. 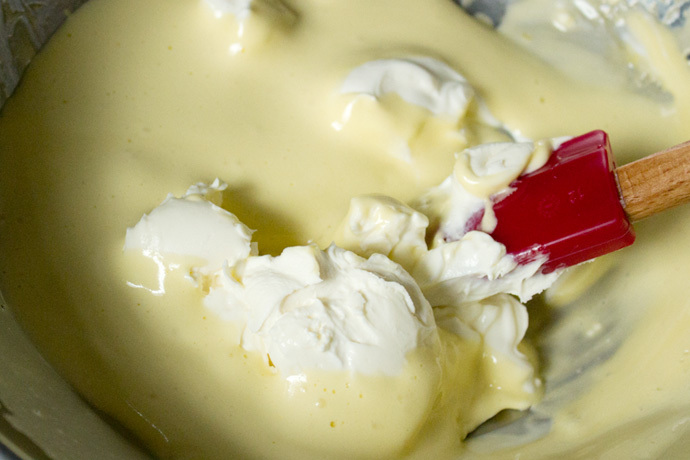 Fold together the lightly whipped heavy cream and the egg mixture. 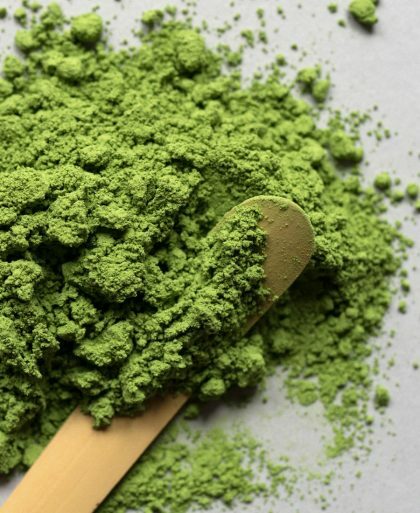 Sift in matcha (1 tablespoon) and mix well. Finally, fold in the mascarpone cheese (2/3 cup). Spoon on the matcha syrup over the sponge cake, making sure the sponge cake gets soaked with the syrup. Dollop the matcha cream on top. Layer on another piece of sponge cake. 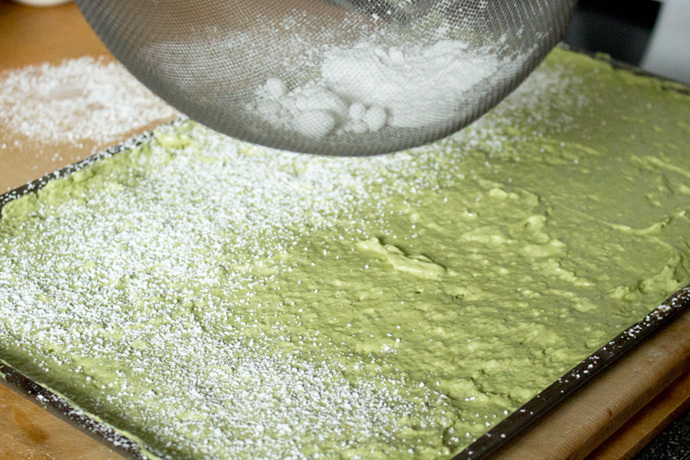 Pour on matcha syrup to the top level sponge cake. 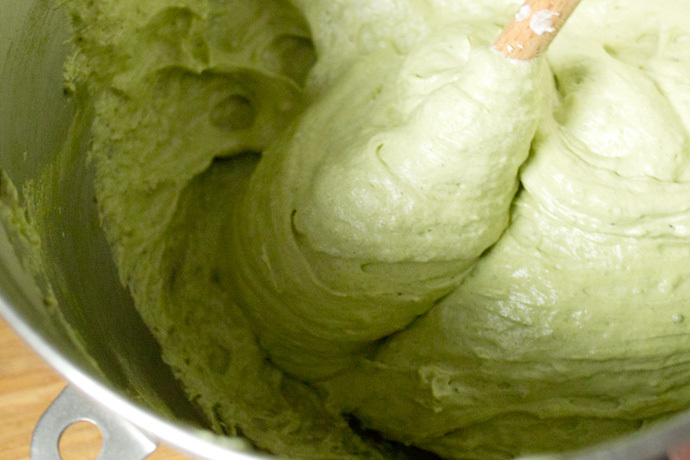 Add the final layer of matcha cream and dust with matcha. 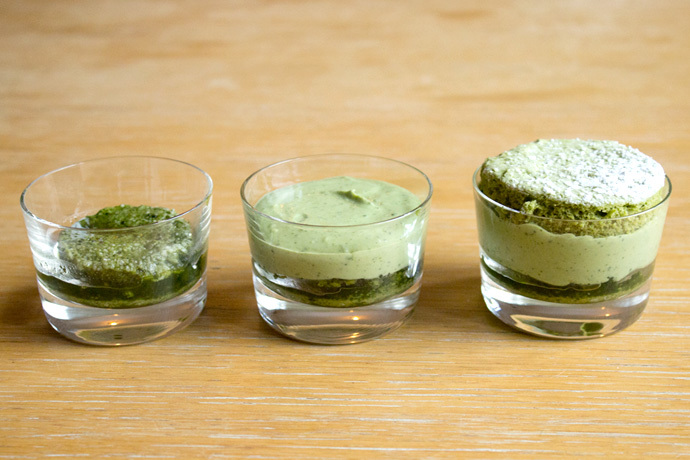 The original and THE BEST Matcha Tiramisu recipe. 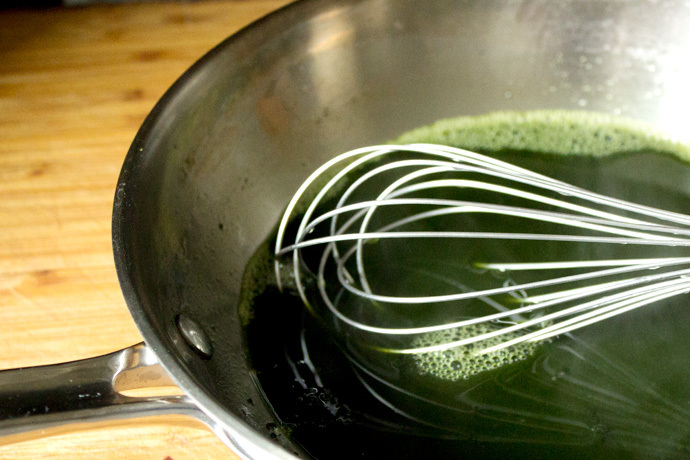 Make the matcha syrup first by bring water (3/4 cup) and sugar (1/2 cup) to a boil. Simmer for 3 minutes and remove from heat. Turn oven on to 350°F. Lay parchment paper on a 13"x18" sheet tray. If the parchment paper rolls up, put a little butter or oil under each corner. Dust the parchment paper with confectioner's sugar. Set aside. Separate eggs (4). 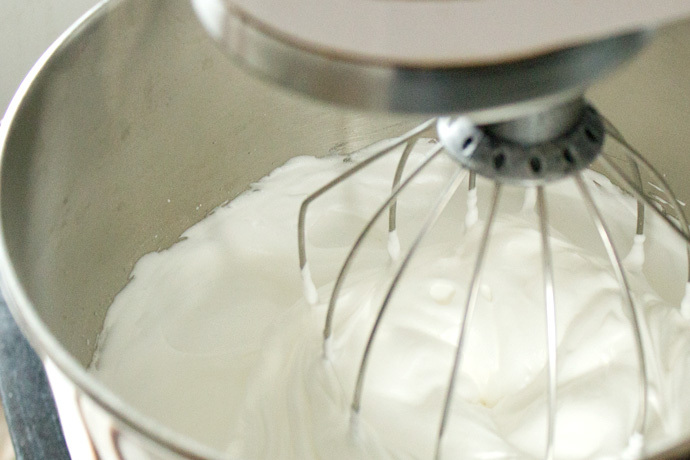 In a mixing bowl, whisk on low speed, the egg whites for 1 minute. Turn up the speed to medium and slowly add the sugar (7 tablespoons). After adding the sugar, turn speed to high. Mix until the stiff peaks form and the egg whites look shiny. Add the egg yolks (4) and fold to mix. 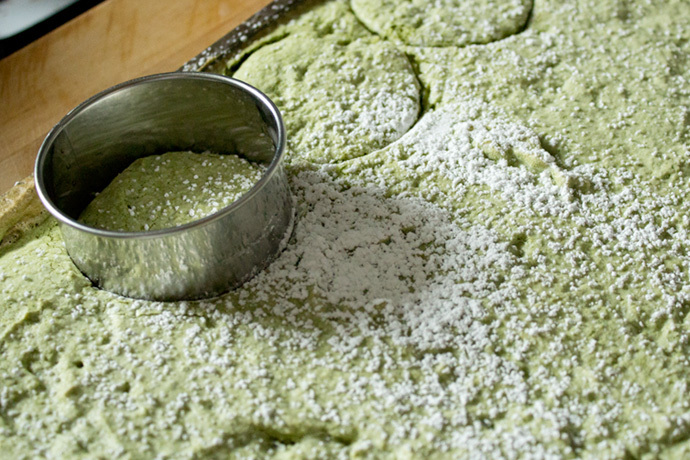 Sift in matcha (1/2 tablespoon) and flour (3/4 cup) to the egg mixture and fold to incorporate. Pour the mixture onto the sheet tray and spread evenly. Dust confectioner's sugar on top. Bake for 10 minutes. Use a cookie cutter (we used the 3") to cut out circles. Continuously whisk all three ingredients together until it thickens to the "ribbon stage" (about 5 minutes). Cool for 5 minutes. 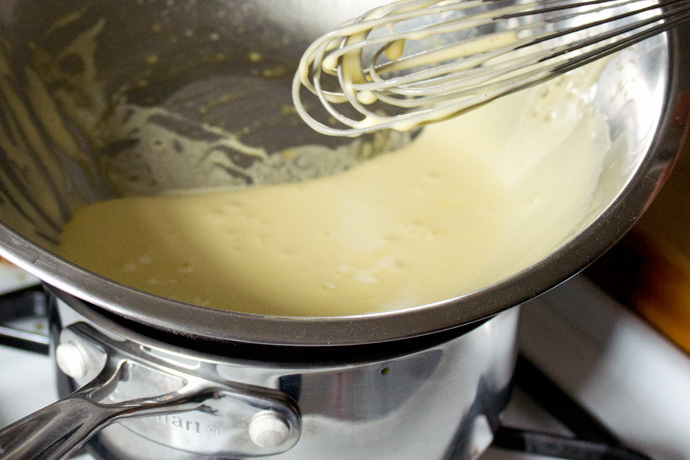 In another bowl, whip the heavy cream (1/2 cup) until soft peaks form. 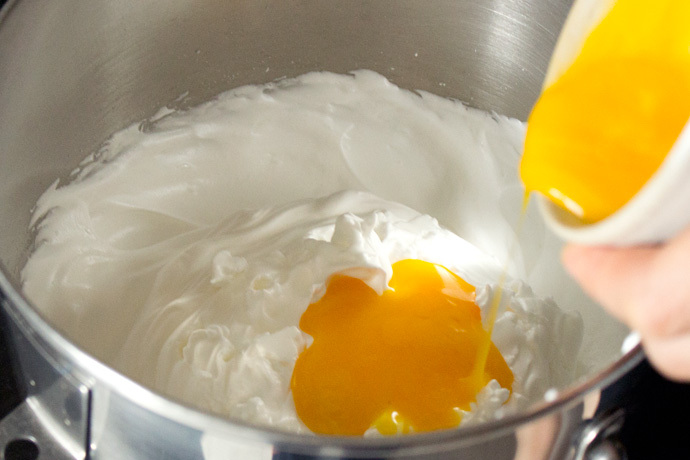 Combine the lightly whipped heavy cream and the egg mixture. Fold together. 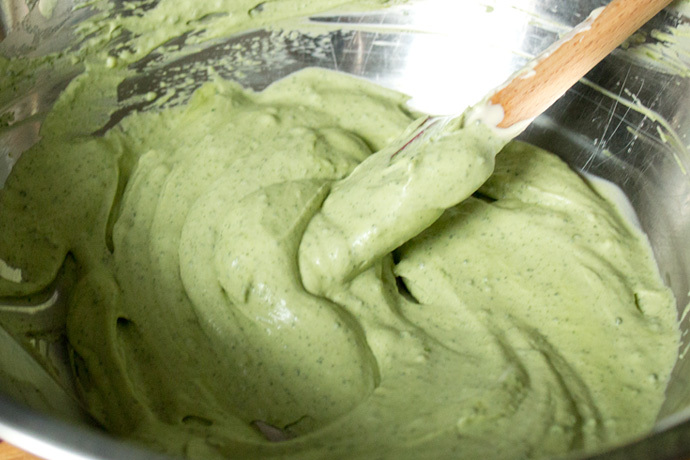 Sift in the matcha (1 tablespoon) and mix well. Finally, fold in the mascarpone cheese (2/3 cup). Can you and Queenie offer a workshop/course, please?! That looks and sounds amazing. Too bad I don't have the patience for making it! Hi Georgia, that's so nice for you to say! Hi DIane, it seems a bit involved but it was quick to make. Try it! What a neat idea! I love tiramisu & I love matcha tea. 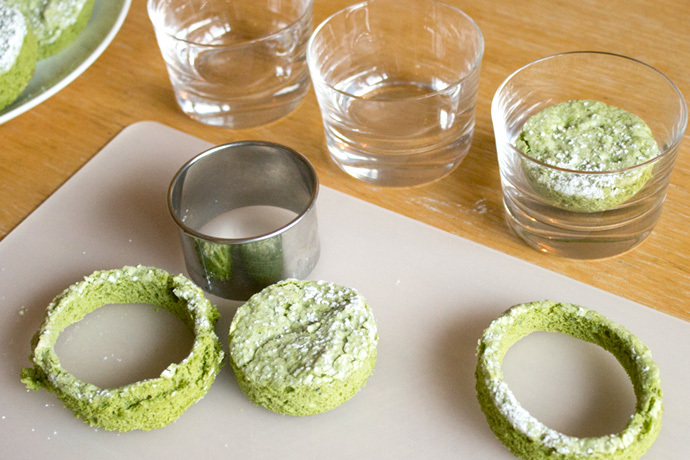 I have a tin of matcha in my kitchen – I might have to go and make this right now. Thanks for the great idea! Hi Beth, thanks and enjoy your Matchamisu! Hi Michele, yes! You'll love it! Looks beautiful and tasty. I'll get some matcha so I can try it! Hi Daniella, YAY! So happy to hear you made it! Hi Laurence, hope you get around to making it sooner than later! Do we really need to put only 2/3 of and once of Mascarpone cheese in the recipe? It doesn't seem enough… Can you help me? This dessert looks beautiful! 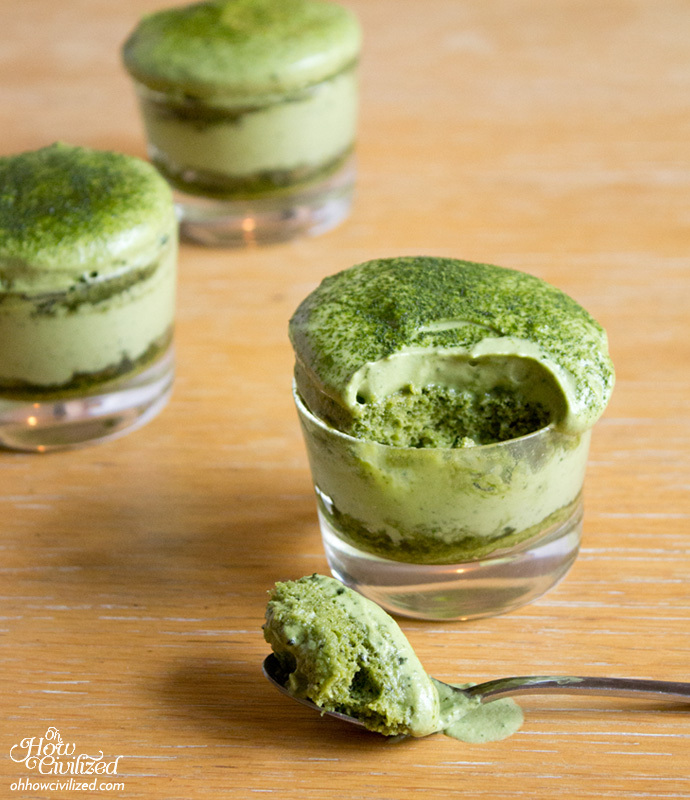 I love making desserts with matcha :3 Also love how your cake rounds fit so well in your little dessert glasses! Hi Alice! Thanks, Queenie did a great job making the dessert look amazing! 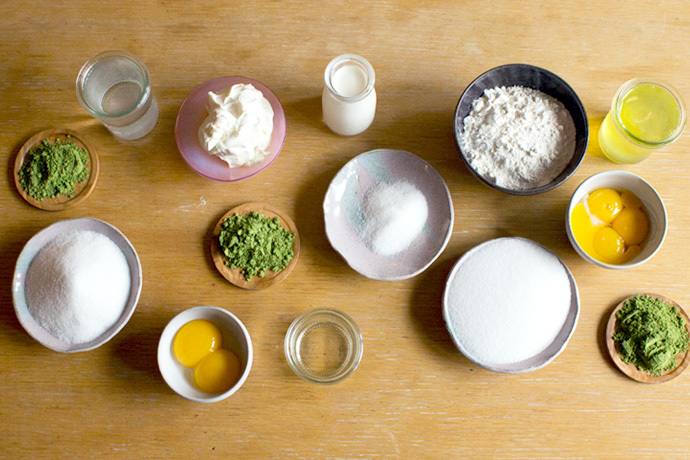 how many small tiramisu can I made with such quantitiy of ingredients? Hi Thao Le, the recipe makes 10 small cups. Hi Tiff, I asked Queenie and she's wondering if you used a double boiler (bowl on top of a saucepan)for the egg yolks, sugar and rum? If you heated directly in a saucepan, it won't create the same result. Hey Jee – yeah we did use a double boiler. I talked to my mom who bakes a lot and she said that the temperature might have been too hot or something along those lines. Hi Tiff, sorry you had problems with the recipe, but happy to hear it turned out delicious! Thanks so much for liking the Matchamisu enough to try making it on your own! Im not sure what happened, but when I was whisking the eggs in the double boiler it was a really small amount it did not look like the picture…..
also i had more cake than cream. Why is that? Hi Patricia, I'm not sure what happened either, but I asked Queenie and she wonders how long you were whipping the mixture for (since it has to be briskly whipped for a while), and wonders if you got to the "ribbon stage"? We only had a small amount too even after it was whipped. As for having more cake than cream, we cut ours with a cookie cutter and we also had some excess cake since we used two sizes for the cookie cutter. This looks wonderful. Do you think the recipe can be used for a trifle sized matchamisus and not individual cups? I'd love to try it for xmas!! Hi Mia, I think you can since we had some extra cream and cake left over. You just will need to eyeball the cream to make sure there are even amounts on each layer. It should be a hit! Hi! 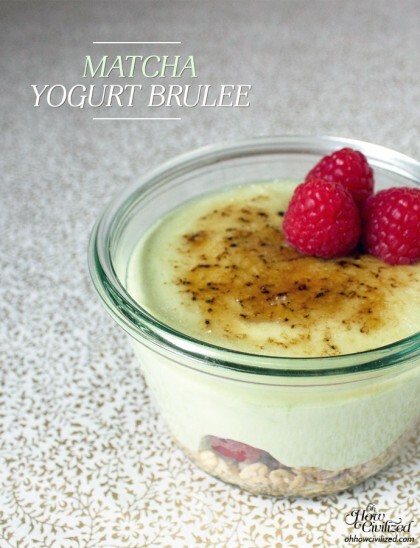 Just wondering, when is the matcha syrup used in the recipe? Hi Estee, the matcha syrup is used in step 17. "17. Spoon on the matcha syrup over the sponge cake, making sure the sponge cake gets soaked with the syrup." If you make the recipe, hope you enjoy it! Why is there 2 cheese for the syrup? Hi, there’s just one cheese – the mascarpone. This recipe is so good! I made it twice already. It’s not too sweet so I’m a big fan of it. The matchamisu was good bakery quality! Thank you so much for sharing this recipe! Hi Cinnabonnie, yay! So glad you made it, and liked it! I’m in NYC too, and can’t wait to check out all of your recommendations for the best matcha in town. Thanks for your gorgeous blog! Hi Jenné, thanks so much for your comment! A chestnut or sweet potato tiramisu sounds delicious — what a fantastic twist on a classic. Thanks for visiting my blog! Oh my gosh, this matcha tiramisu sounds heavenly! I love matcha- can’t wait to try this! Hi Genevieve, it’s matcha goodness! Do you have to let the matchamisu set overnight or is it ready to serve right away? Thank you! Can’t wait to try! Hi JJ, nope, no need to set it at all — you can start eating it right away! Hi Miche, thanks for catching that! It’s 1.5 tablespoons — just made the update. I would like to add this to a traditional afternoon tea event in my cafe. Is it possible to make the day before and keep in the fridge? Would it taste as good? or would it be better to make all the components the day before and assemble the day of the event? Hi Tania, I asked Queenie, the one that created the recipe and she says: "Not a problem to assemble the day before. Be sure to cover it will with saran wrap to not get a skin on top and also dust matcha on top before serving. " Hi Tilly, to lessen the matcha taste, you can try omitting the matcha from the matcha syrup or use half the matcha from the syrup, the sponge cake, and the cream. Hi. I was wondering what type of rum you used for this recipe. And also, can I make a 9 inch out of this recipe or do I have to alter the ingredients? Thank you so much! Hi Huong Le, I’ve never tried freezing it so I can’t say how that’ll turn out. Wow this looks amazing! Thanks for sharing, I can’t wait to try it and see if it tastes as good as it looks! Hi Rob, let me know how it goes! Hi May, yay! So happy to hear you made it! Hope you both enjoyed! This recipe looks amazing! Will definitely like to give it a try. Have you tried the Cold Brew Iced Green Tea? Hi Vedika, yes, give it a try! And yup, I make cold brews of green, oolong, and black tea in the summer! I would love to try this recipe! However, I’m a muslim so we can’t have alcohol, so would there be any way to substitute the rum? Hi Maria, you can take out the rum and replace it with vanilla simple syrup. Combine and boil 1 part sugar to 1 part water until sugar is dissolved. Take off heat and add some vanilla.